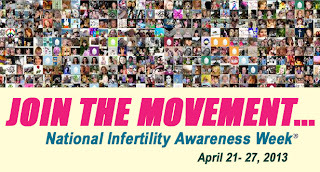 This week was national Infertility Awareness Week. 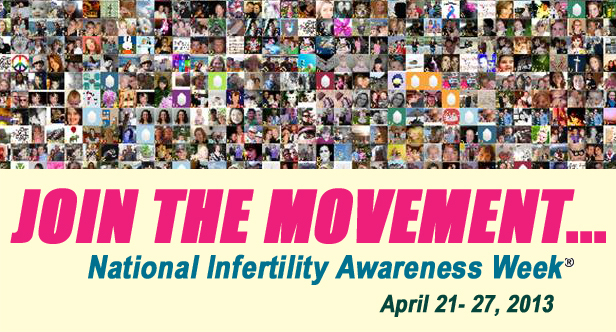 I thought because of that I would share my battle with infertility. From as far back as I can remember I have known it was part of my life path to be a mom. It was my purpose. Also I had always known that women in my family got pregnant really easily. So throughout high school my husband then my boyfriend and I were super careful not to get pregnant. We knew we wanted to get married and have kids one day but not in our teens. Then we got married in July 2004 and I went off birth control in October of 2004. We were excited to start a family. Nothing happened month after month. Finally in July of 2005 I got a positive pregnancy test. We were ecstatic. Not long after I suffered a miscarriage. It was devastating. I wasn’t very far along but it was very upsetting to have waited for this baby and lost it so quickly. We started trying again and I went for testing at my doctors. I found out that I had PCOS which made my periods irregular and getting pregnant difficult. We kept trying and very quickly after making a treatment plan in February 2006 I found out I was pregnant again. The first few months were challenging. My blood work showed my numbers weren’t good and we tried everything to save the pregnancy. Luckily we were able to and our daughter was born in October. Even my doctor was surprised the pregnancy made it and we were very grateful. Then 6 months after my stroke my doctor said he advised against me getting pregnant. I went to all my specialists and after a lot of tests they finally a year later said that they thought a pregnancy would carry minimal risks. So at some point we will go forward with another pregnancy but there is some anxiety in us about what a pregnancy would do to me. We have thought about adoption and its an option but I would like to be pregnant again. I know my path is pretty minor as far as infertility goes and I am lucky to have one child but I think anytime getting pregnant is a challenge it is heart breaking and stressful. especially when people around you are getting pregnant with such ease. So my only advice is that if you are pregnant don’t brag about how easy it was to get pregnant or how quickly it happened you don’t know if someone around you is struggling to get pregnant. It’s funny (well not really funny) how life turns out, you have plans then they don’t go your way. I could never picture myself with children but always hoped I would. I then met my husband and he told me that he had had a vasectomy (a long and complicated story). We said that we would both like a child together and planned to get things reversed. Sadly by the time we could afford to do it, a lot of time had passed and it wasn’t successful. So we have had to accept that our own children are not in our future. Well unless we decide to adopt. It’s not been easy but at least I have a wonderful Hubby. I’m so pleased that you got your little girl and I hope you have further success. You certainly haven’t had it easy either. Stroke, that’s scary. Thanks for sharing, such a personal story in aid of creating an awareness for infetility.